8vo. (204 x 120 mm). 245, (5) blank, 56 pp. Latin. Written in a very small hand in ink on laid paper. Illustrated with 34 figures including 12 in the magnetism section and 20 in the astronomy section. Original quarter calf, spine gilt, boards covered with a leaves from an early printed book, Gothic type with rubricated initials. Spine chipped, joints weak, the text in very good condition. This fascinating scientific manuscript documents the state of scientific knowledge and education in France in the years following Galileo’s trial and the Church’s prohibition of Copernican theory. The manuscript comprises three parts: Physics (De Corpore naturali inspecie seu Mondo Coelo and Elementis, Generatione and corruptione rerum Meteorisque, etc), Magnetism (Tractatus de Magnete, Historia Magnetis), and Astronomy (of Praxibus Astronomicis, Systema Copernici explicatur, etc). The Astronomy section includes discussions of the world systems, especially that of Copernicus, and the names of Galileo, Gassendi, Kepler, Tycho Brahe, and others appear. The Magnetism section incudes mentions of Gassendi, Maignan, Descartes, Galileo, and Kircher, all of whom made vital contributions to the field in the seventeenth century. The Church declared heliocentrism to be heretical in 1616, and in the following years the Jesuits, especially astronomer Giovanni Battista Riccioli, were at the forefront of efforts to oppose the theory. This manuscript was evidently written at a Jesuit institution. The writer refers frequently to authors commonly cited by Jesuits. Copernican theory (admitted to be the “ingenious Copernican system”) is opposed by the theories of Riccioli. A sample calculation in the Astronomy section states “Hic Lugduni” (here in Lyon). These facts combine to suggest that the manuscript is by a teacher or student at the Jesuit Collège de la Trinité in Lyon. The organization is consistent with university textbooks of the seventeenth century, particularly with the use of “disputationes, abjectiones, quaestiones and reponsiones.” The manuscript’s clean lines and careful organization and orthography suggest that these are a teacher’s lecture notes. The Collège de la Trinité had a long tradition of excellence in the sciences, especially astronomy, with faculty including Honoré Fabri (1608-1688) and Claude Francois Milliet Dechales (1621-1678). The Jesuit teachers of science at the Collège de la Trinité at this period include Dechales, Pierre Port (1660-1661), Jean Bertet (1661-1665) and Pierre Violet (1665-1667) (see François de Dainville, Revue d’histoire des sciences et de leurs applications, 1954). An astronomical observatory was built at the school in 1701. The manuscript can be dated with some accuracy. A reference to the year 1662 appears in an astronomical calculation. The text refers to Bullialdus’s Astronomia Philolaica (1645) and Morin’s Tables Rodolphines (first published in 1650). This fine manuscript merits further study and publication. 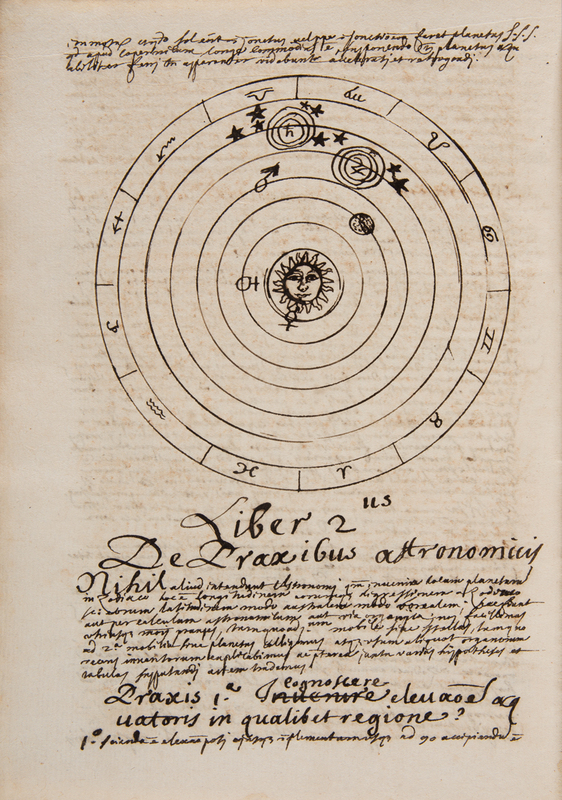 Its astronomical diagrams make it ideally suited for an exhibition on the Copernican controversy. Provenance: engraved bookplate with the coat of arms of Anne-Joseph d’Azincourt (1644-1689) (see Martin & Meurgey, Armorial du Pays de Tournus, 1920, and Marchand, Blazons du Bourgogne, 1975- 2001). Anne-Joseph of Azincourt, born in 1644 in Tournus, was a lawyer and jurist and alderman of the city of Dijon in 1687. Anne-Joseph d’Azincourt was the son of Charles d’Azincour, médecin ordinaire to Henri II of Condé c. 1645. We gratefully acknowledge the assistance of Professor Owen Gingerich in analyzing this manuscript.